It's that time of the year again, when we will see Aishwarya Rai Bachchan sashay down red carpets at the Cannes International Film Festival next month. Ash has had various levels of success in her fashion appearances, and is usually well turned out at these international events. But just once in a while, she gets it wrong -- and we're not even talking about her infamous 2003 outing. She may have found her fashion mojo now but she isn't immune to slip ups. Here's looking at some of her Cannes missteps over the years! Ash slipped into this ghastly cuotut dress for the opening dinner of the 57th Cannes festival in 2004, showing off more cleavage then we expected. Many fashion observers may have missed the fact that she was wearing Chopard jewellery with the dress for obvious reasons. For reasons best left unknown, Ash wore this bizarre outfit to a Cannes photocall as a jury member in 2003. 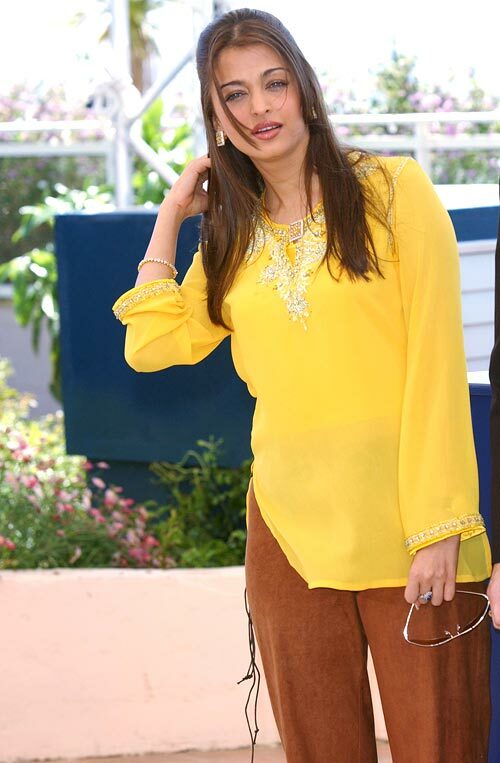 She looked horribly underdressed in the yellow kurti and brown (drawstrings, perhaps?) pants. In 2010, Ash had pretty much everything going for her. Her dreamy Ellie Saab gown was stuff red carpet legends are made of and her makeup, jewellery etc were bang on. She did stumble at hairdo. The fierce buffount and the extensions at the back did not go well with the look. They wouldn't go well with any look. Just like bad hair days, bad makeup days afflict many of us and celebs are not immune to it either. At an awards giveaway in 2003, Ash looked arrived wearing almost no eye makeup and weirdly-coloured hair. The bronze make up made her look jaded. At the 2007 Cannes ceremony, Aishwarya wore so much eye makeup, it was difficult to focus on anything else. Her silver overdose of eye shadow matched her gown but was a serious overkill. At the Heroine photocall last year, Ash was a charmer in a cute summer dress. But this awkward pose sort of ruined it. The actress really brought on the bling with wearing everything she could find in her jewel box for a charity event in 2003. She wore gold bangles, a necklace and earrings with a subdued gown. Vote for Aishwarya's best look at Cannes! Pix: Who wore it best at Cannes?